Rustic country Provincial style book case or book shelf with carved scalloped details will be useful in any room for books or displaying collectables. The shelving unit has been white washed for added charm. Perfect bookcase for a children's room. Classical brass and wood etagere with 4 shelves. Great for displaying photos, books or collectables. A wonderful size for any room and be able to fit into tight spaces. 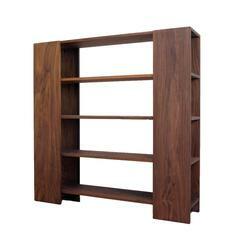 1970s French freestanding bronze bookshelf with fittings and wooden shelves, in the style of Maison Jansen. French walnut hand carved four shelves open bookcase in Louis XV style. Massive and stable in very good condition. France, circa 1890.